The Earth rotates along its spin axis which intersects the surface at the North and the South pole. Equidistant from the two poles, lies the equator. The equator, an imaginary great circle, divides the Earth into the Northern hemisphere and the Southern hemisphere. When you describe your location north or south of the equator, you specify your latitude. 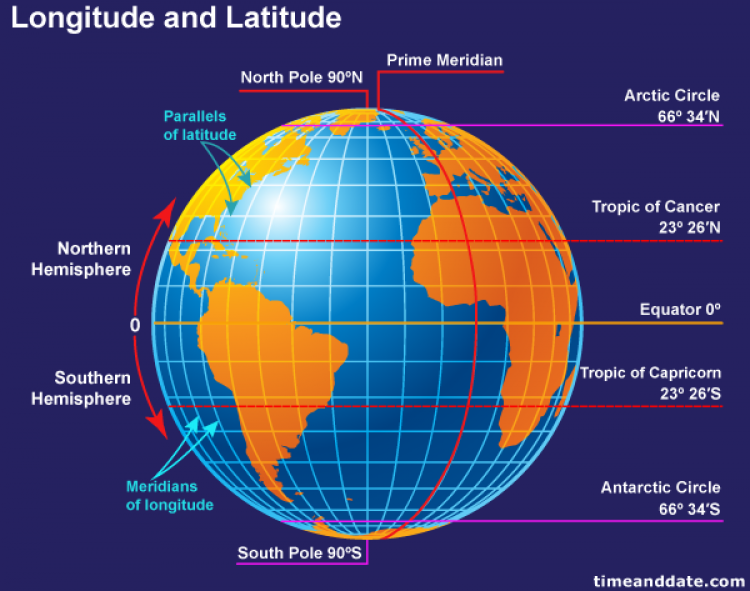 Latitude ranges from 0º at the equator to 90º at the north pole and -90º at the south pole. Parallels of latitude are perpendicular small circles to the spin axis. Parallels of latitude follow a single latitude and span the entire range of longitudes. 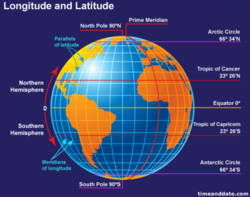 Some notable parallels of latitude include: the tropic of cancer, at 23° 26′N, and the tropic of capricorn, at 23° 26′S. During the winter solstice, the sun is the zenith at 23° 26′S and during the summer solstice the sun is the zenith at 23° 26′N. Another set of notable parallels of latitude include the antarctic circle at 66° 34′S and the arctic circle at 66° 34′N which mark the lowest latitude that experiences an entire day of sunlight- during the summer solstice- and an entire day of darkness- during the winter solstice. The equator lies between the two poles, but there is no equivalent meridian of longitude to the equator, so an arbitrary center- the prime or greenwich meridian- was selected. The prime meridian divides the Earth into an Eastern and Western hemisphere. Longitude specifies your position East-West of the prime meridian. East of the Prime Meridian is positive and ranges from 0º to 180º E, while west is negative and ranges from 0º to 180º W.